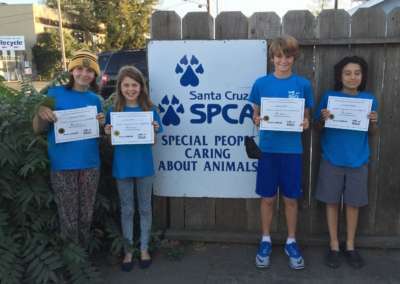 The Santa Cruz SPCA recognizes that a community without pet over-population, abuse, neglect, homelessness, and other animal welfare issues begins with the education of youth and adults alike. 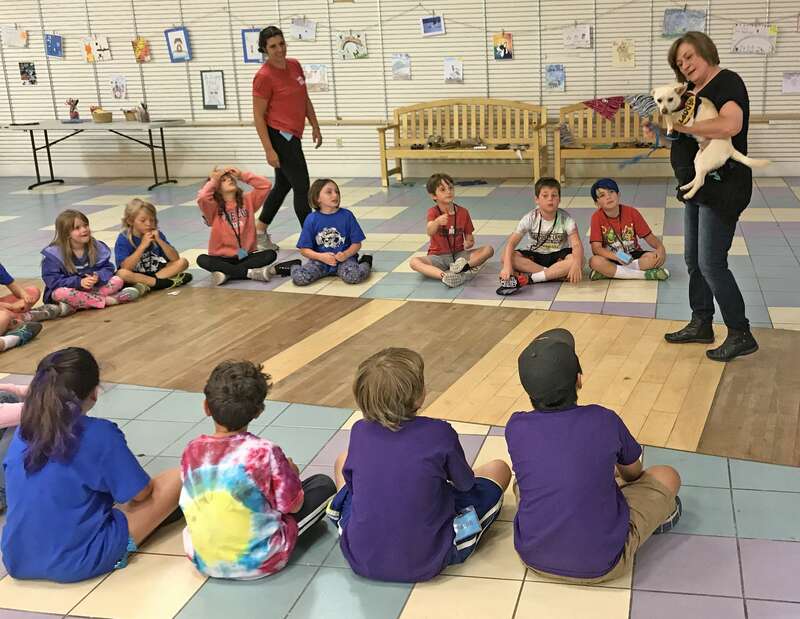 From adult informational seminars and classroom presentations to educational camps and shelter activities, we strive to make animal-care knowledge available to anyone and everyone. 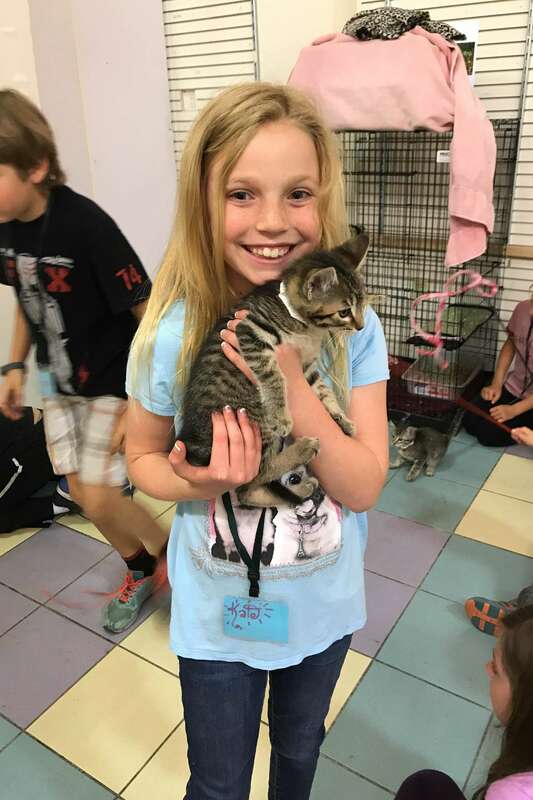 Our humane education programs cultivate compassion and respect for all animals by promoting proper care and responsible action. Have questions? 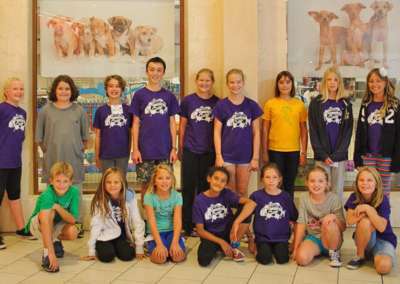 Visit the FAQ tab on this page or contact our Humane Education team at 831-566-3753 or send us an email. 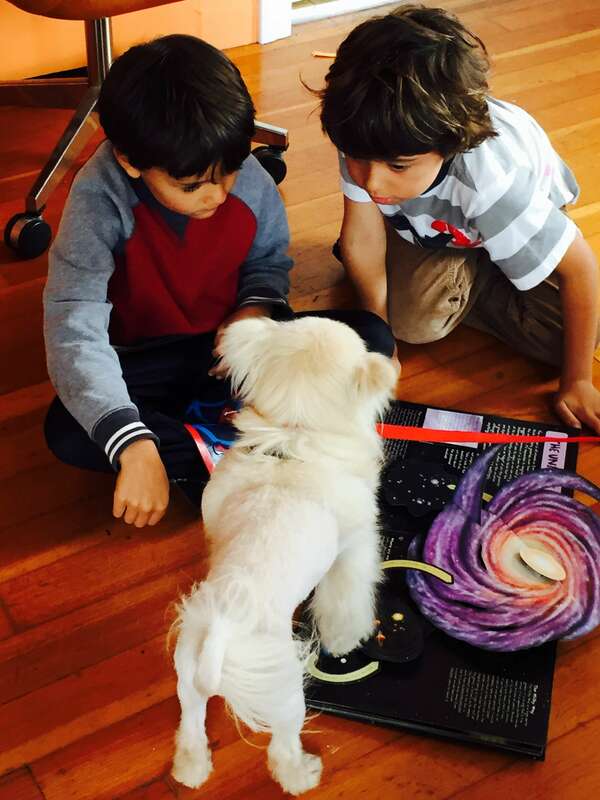 The kids of today are the companion animal guardians of tomorrow. To curb issues like animal abuse, neglect, and over-population in the future, we have created fun-filled programs that help young people understand animals and make positive choices for their community, now and for the rest of their lives. 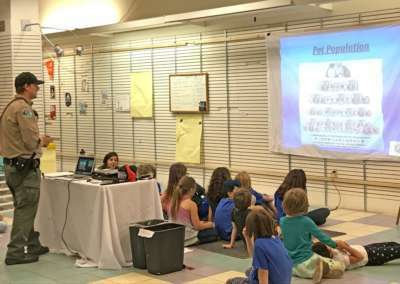 Each P.A.W.S session meets once a week for three weeks. New sessions start each month, September through May. 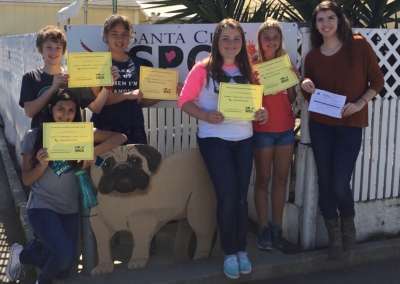 Many area middle and high school students are required to meet a certain number of community service hours in order to graduate or meet their program goals. We realize that these students may not have the desire, nor the ability, to commit to volunteering with us for the long term so Community Service Saturdays was developed in an effort to both serve our community’s youth and to allow us to benefit from their valuable volunteer time! 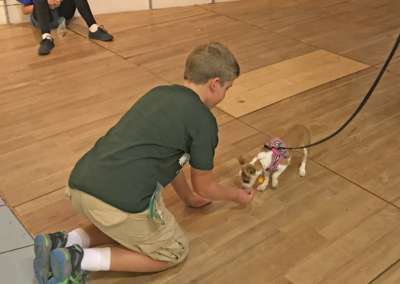 We are able to accommodate up to ten middle and/or high students who are supervised by the SCSPCA's Humane Educator or their designee. 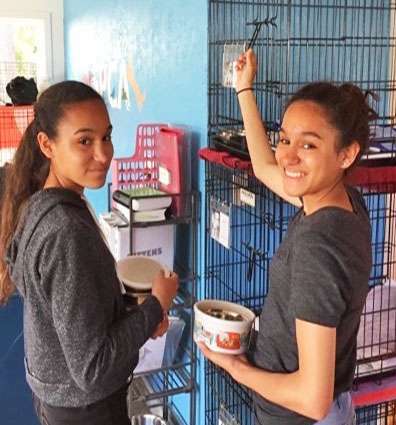 Students will complete work, that can include but may not be limited to, shelter site maintenance, office filing and sorting, data entry, cleaning of the shelter site and animal enclosures, dog walking and cat TLC. 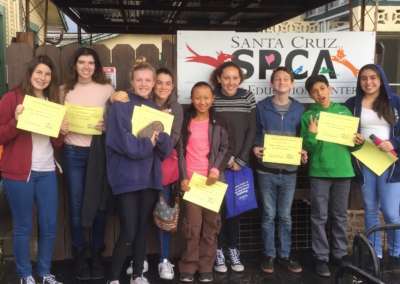 Summer and winter school breaks are an ideal time for young people to experience animal rescue, learn animal stewardship — and have fun in the process. 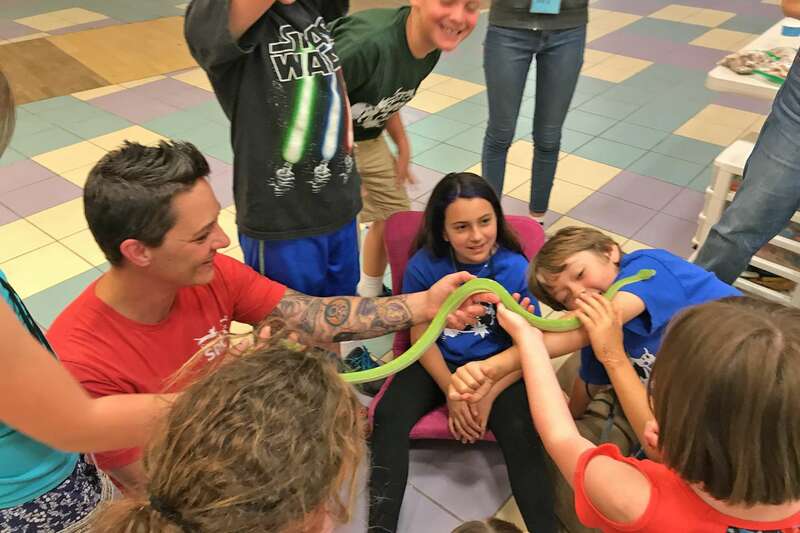 Our popular camps engage kids in grades 1st – 7th, providing a hands-on learning experience through games, crafts, lessons, and animal interaction and activities. Want to receive notifications when camp dates are announced? Email us to be notified. 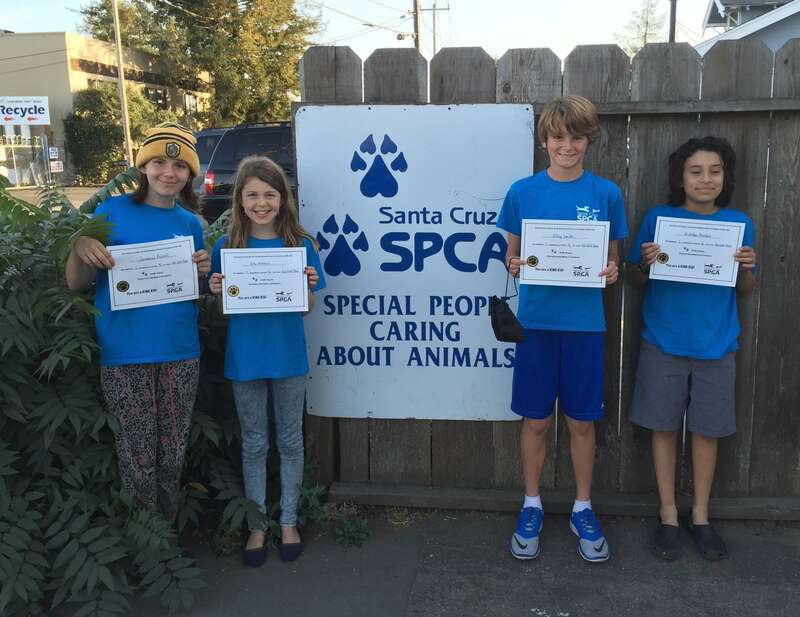 Every summer, the Santa Cruz SPCA offers eight sessions of Summer Camp (each session is one week long). Campers learn key elements of animal care, experience shelter animals first-hand, take part in animal themed arts and crafts, and enjoy a variety of animal “visitors” from other local organizations. Questions? Click the FAQ tab above! Winter Camp 2020 Dates and Themes TBD! Winter Camp dates for 2020 TBD! 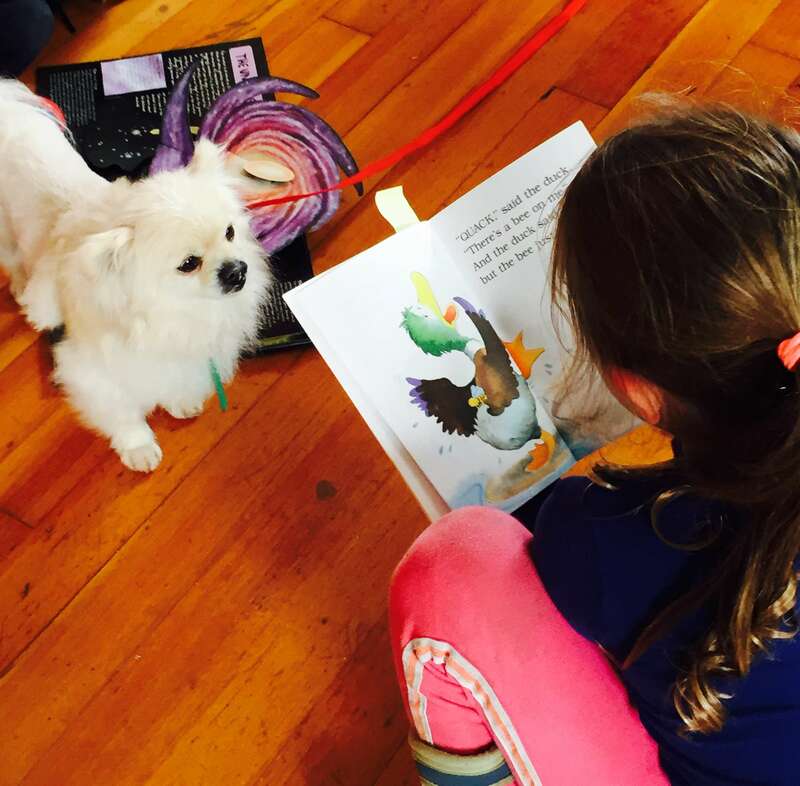 Sometimes the ideal audience for a new reader is a doting dog or cat who hangs on every word, whether or not it’s pronounced correctly. 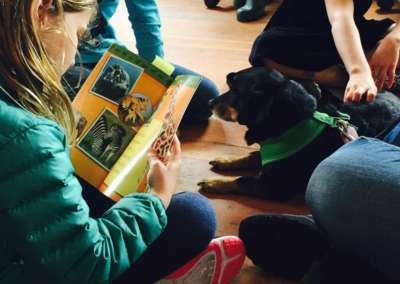 To facilitate these connections, the Santa Cruz SPCA offers Rescue Readers, a program designed to give young readers a chance to practice and enhance their literacy in the comfortable presence of shelter animals or our education dogs, Lupita and Poe. 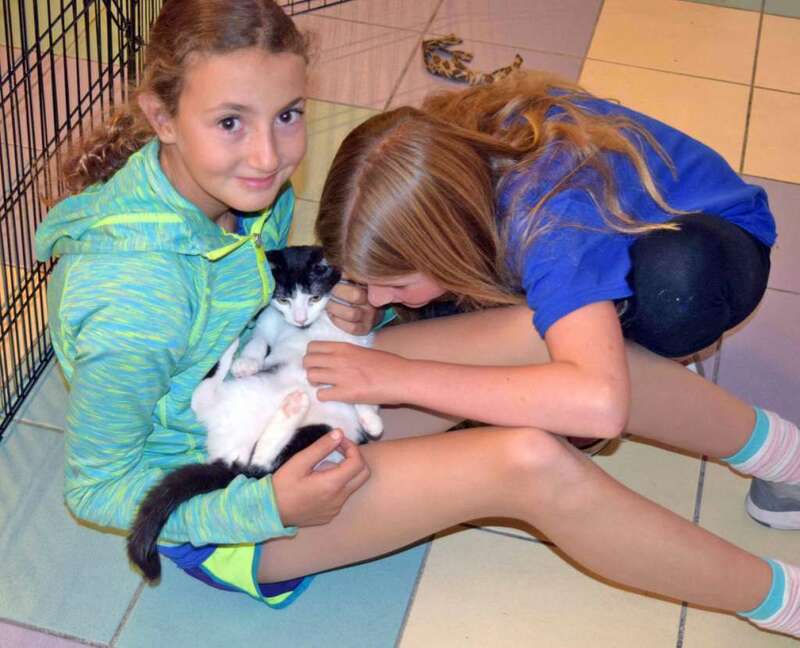 These cute, cuddly, judgment-free listeners enjoy the extra TLC while they wait for their forever homes. 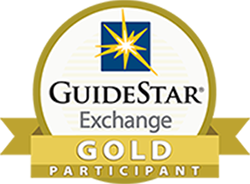 This program is for individual students or groups in grades K–8, and is offered throughout the school year. 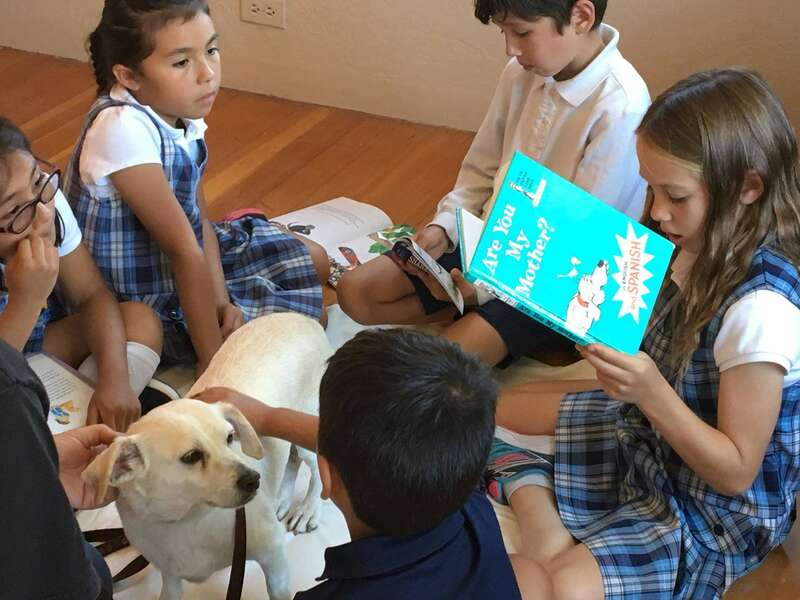 Reading sessions can be scheduled Monday through Friday, 11 am- to 6 pm, with our Humane Education Coordinator. 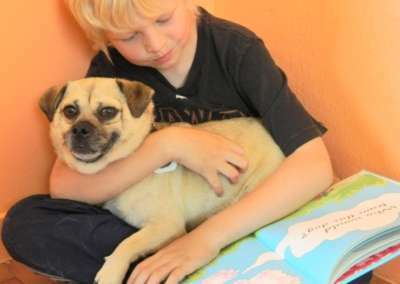 Reading can be done at the shelter or in your classroom. Rescue Reader animals are specially selected to ensure a positive and enriching reading environment. 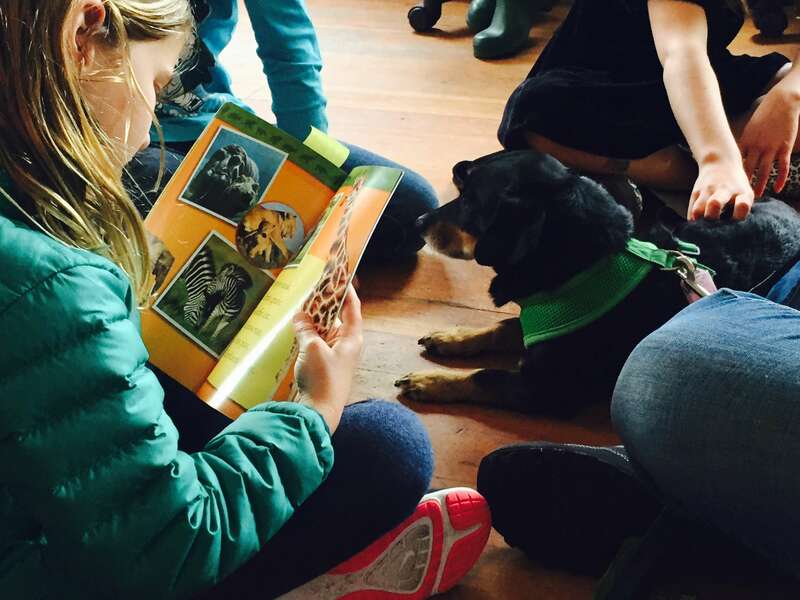 Readers and animals are supervised by our Humane Education Coordinator. However, we ask that parents or teachers stay with their readers. 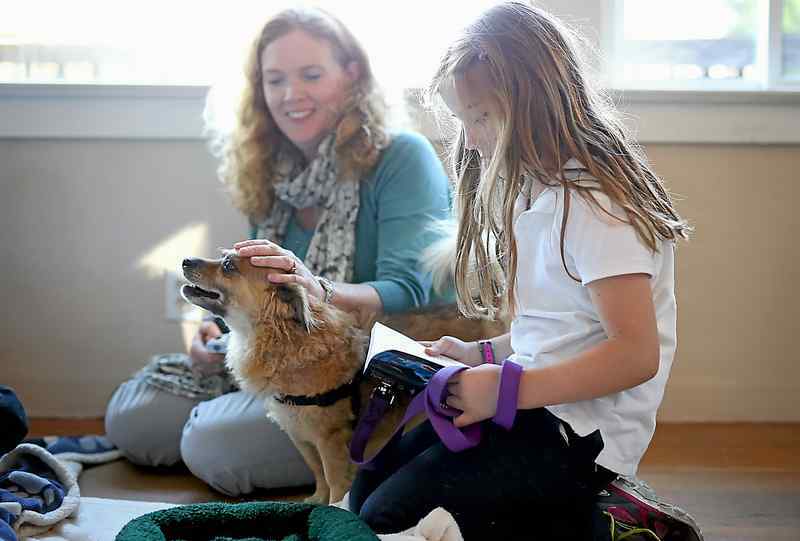 To schedule a session, email our Humane Education Team or call 831-566-3753. 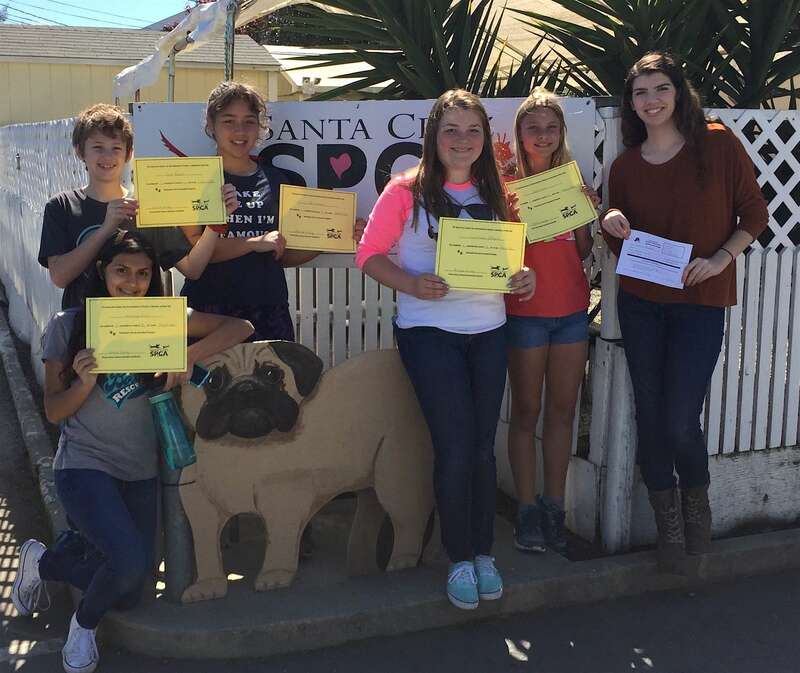 Announcing the annual SPCA poster contest in honor of “Be Kind to Animals” Week! 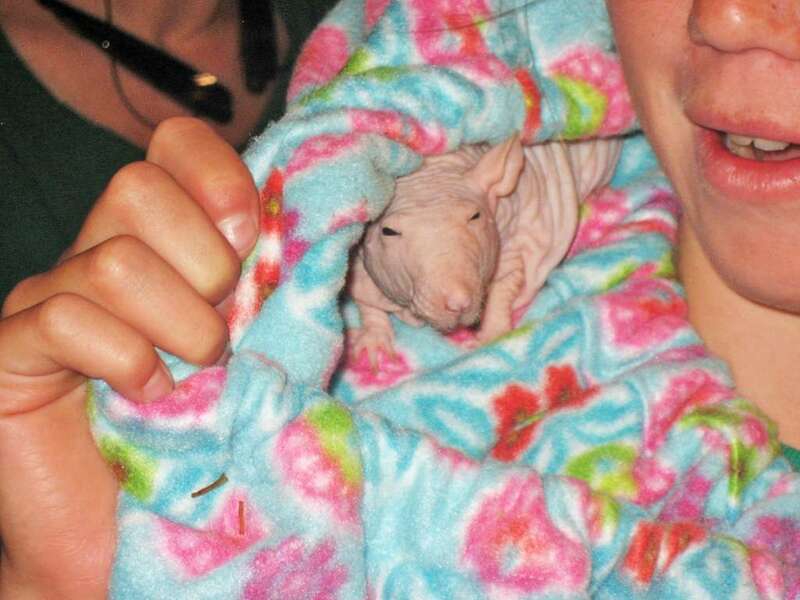 This year’s theme is “The Coldest Noses have the Warmest Hearts”. We are asking all our young artists out there, in Kindergarten through 12th grade, to show us what this theme might mean to them. Any artistic medium is acceptable however, the art should reflect the theme. Posters can be no larger than 11 x 14 inches; submissions must have a semi-firm backing. All posters must be labeled on the front lower corner with the artists full name, grade, teacher’s full name, school name, and contact phone number. 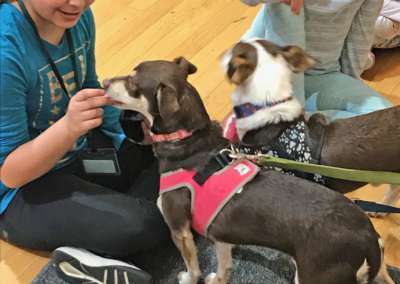 After “Be Kind to Animals Week” (the first full week of May), winners from each grade/grade group will be selected and will be recognized for their wonderful and inspiring artwork with a visit from the SPCA to present their award. Submitted posters will be displayed during the month of May at the Santa Cruz Main Library and the Freedom Branch of the Watsonville Public library. Announcing the annual SPCA poster contest in honor of “Be Kind to Animals” Week! 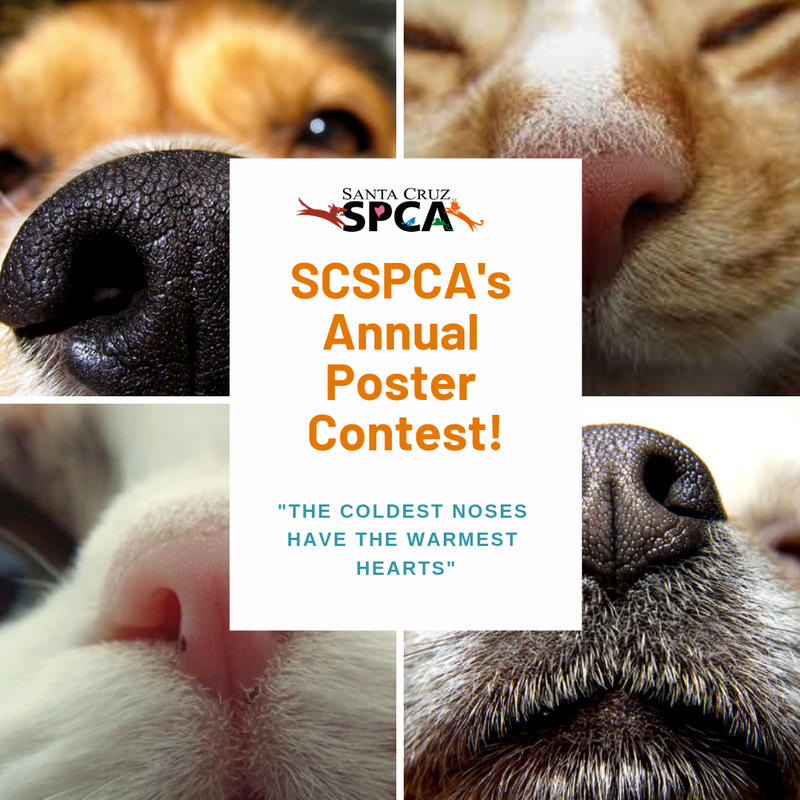 If you have any questions about the 2019 Poster Contest, please contact the education department at 831-566-3753 or e-mail us at brenna@spcasc.org. 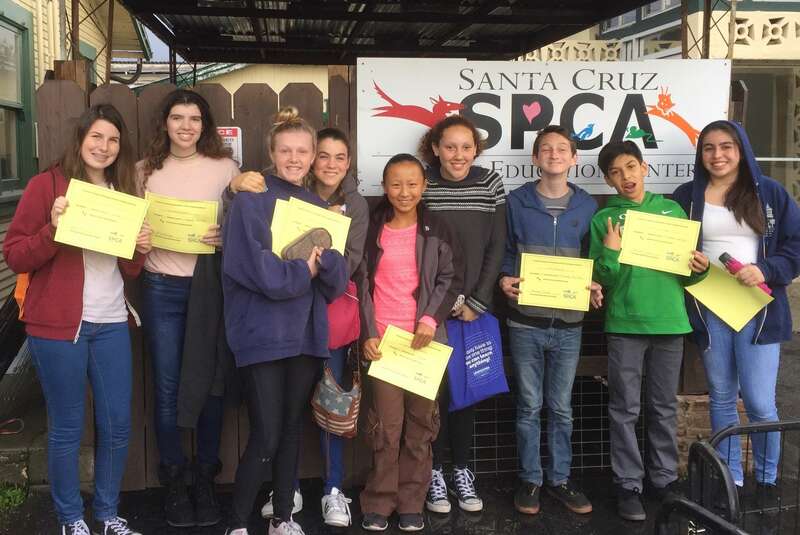 Our wide range of Humane Education Classroom Presentations support next-generation animal advocates and steward a more humane community in the future! 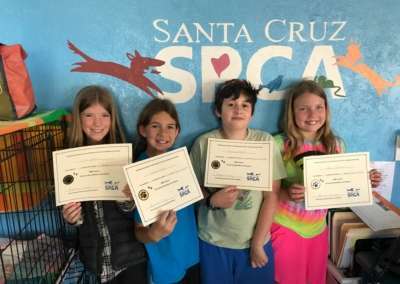 Presentations are available for single classrooms, assemblies, kindness or career events, and after-school programs at no cost — however, donations to the Santa Cruz SPCA are much appreciated. Complete an activity from our Community Service Action Guide. 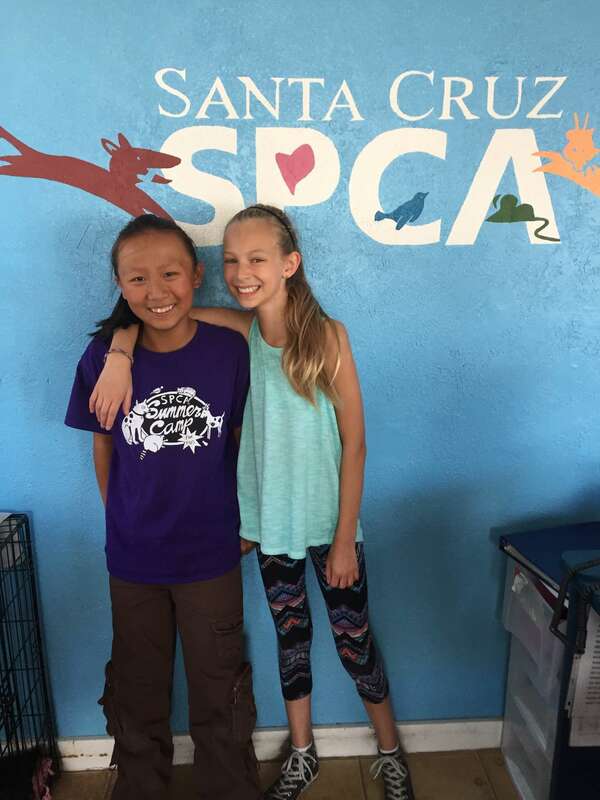 Volunteer at the Santa Cruz SPCA! 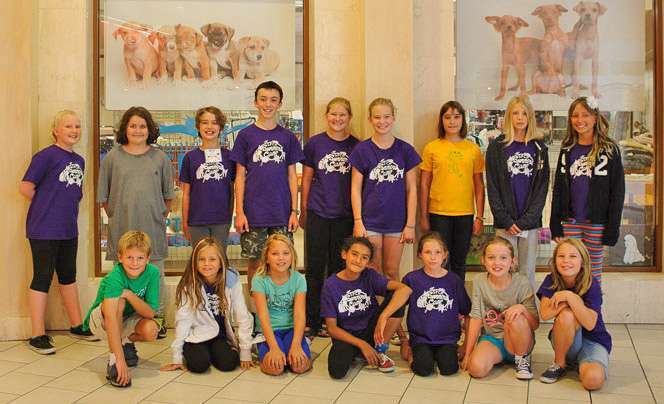 We have a junior volunteer program for ages 7-15 and a general volunteer program for ages 16 and over. Families can even volunteer to foster shelter animals at any time! 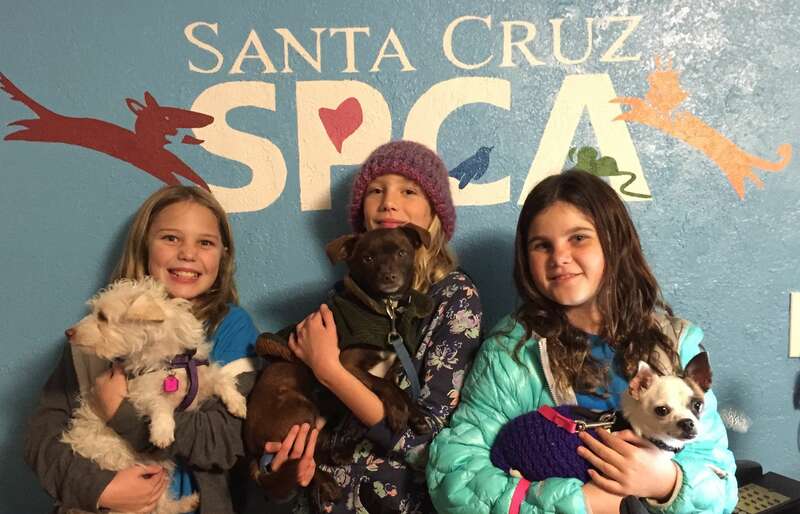 Report animal cruelty to Santa Cruz County Animal Shelter at 831-454-7200 or by calling 911. 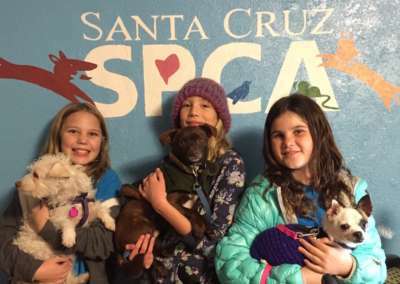 Tell everyone you know about the Santa Cruz SPCA and the programs we offer. 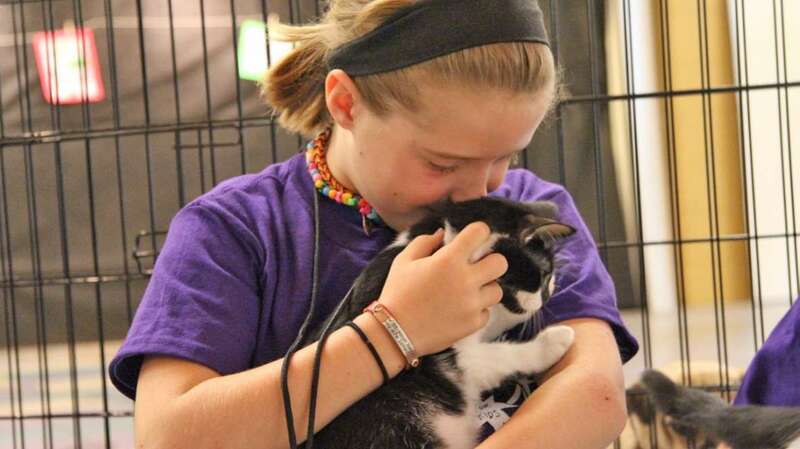 If family or friends are looking to adopt an animal, tell them to check out our local shelter. 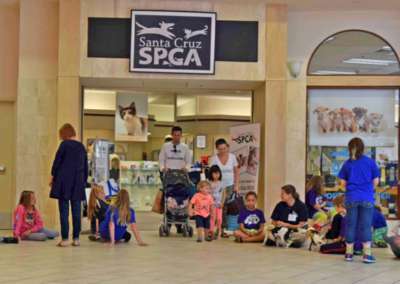 Both Summer and Winter Camps are held at a space in the Capitola Mall near our SCSPCA Adoption Center and Gift Shop, allowing campers access to our shelter animals on a daily basis. The space is safe, private, and closed to the public. 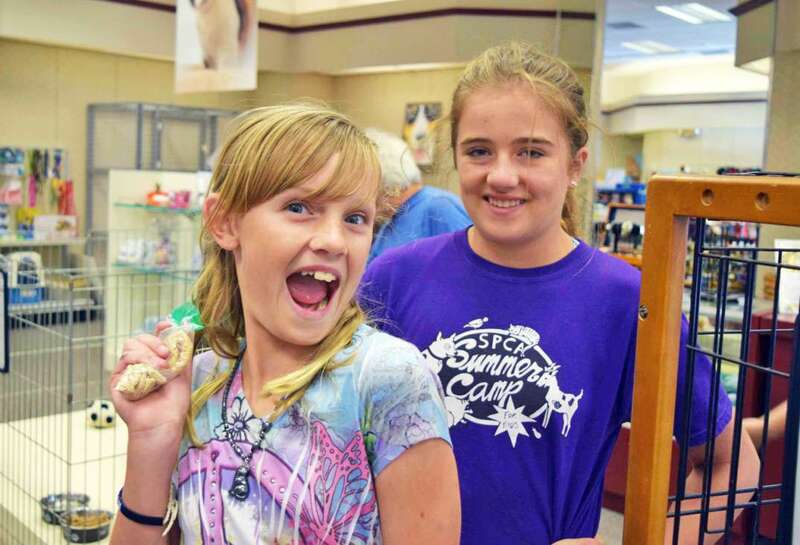 Camp runs Monday through Friday, 9:00 a.m. to 3:00 p.m. 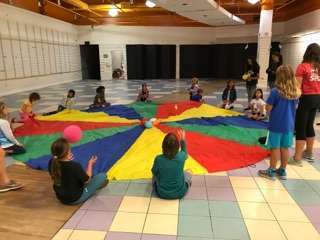 Please arrive no earlier than 8:45 a.m. and plan to pick up no later than 3:15 p.m. Because we do not have facilities or staff to supervise children after camp is over, it is very important that campers be picked up on time. Should my child be there every day? Yes — because they won’t want to miss a thing! 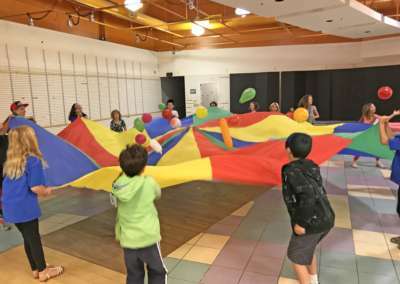 Some camp activities build on previous days, so if a day is skipped, they might miss something important. If you need to miss a day, please let us know. What will they do during the week? 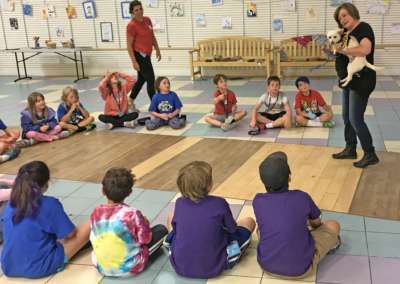 This is a humane education-based camp aimed at teaching campers the value of all life and how they can contribute to the well-being of animals and the environment in our local area. We’ll talk about and meet many different kinds of animals and we’ll explore how we relate to animals in our world. 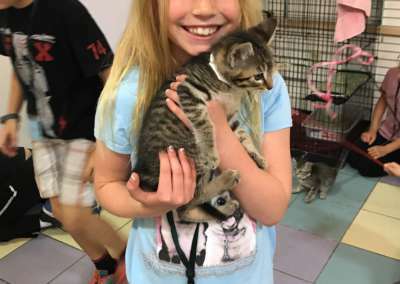 They will experience a variety of activities, crafts, and games that will not only be fun but will teach them about animals and about what a shelter does. 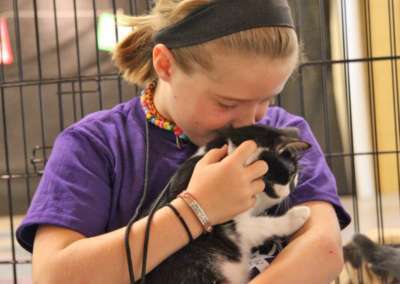 Many of our crafts and activities directly benefit shelter animals. We also have quite a few interesting guest speakers, accompanied by many kinds of animals. 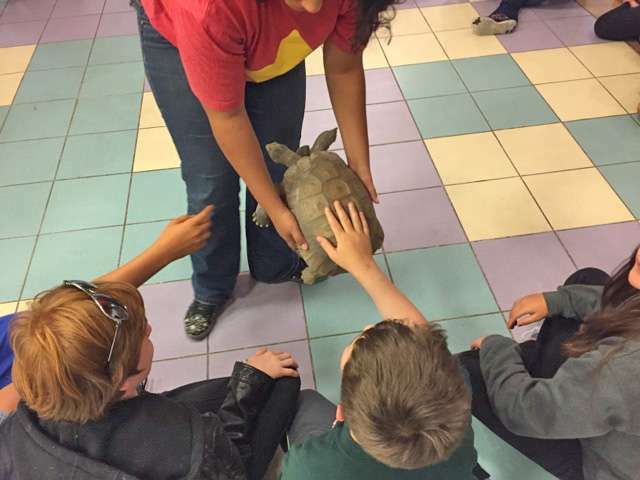 Will they get to meet any real animals? Yes! 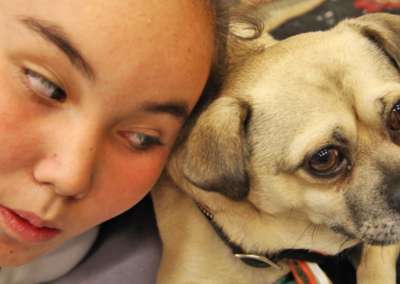 Campers will have the chance to hang out with dogs and cats from the SCSPCA and give them some TLC. 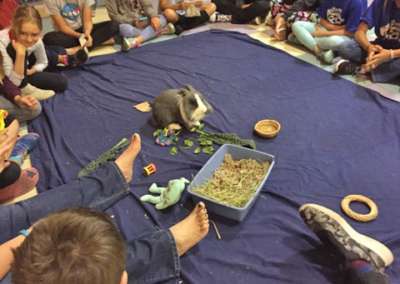 They will also visit with rabbits, birds, and other animals brought by our presenters. 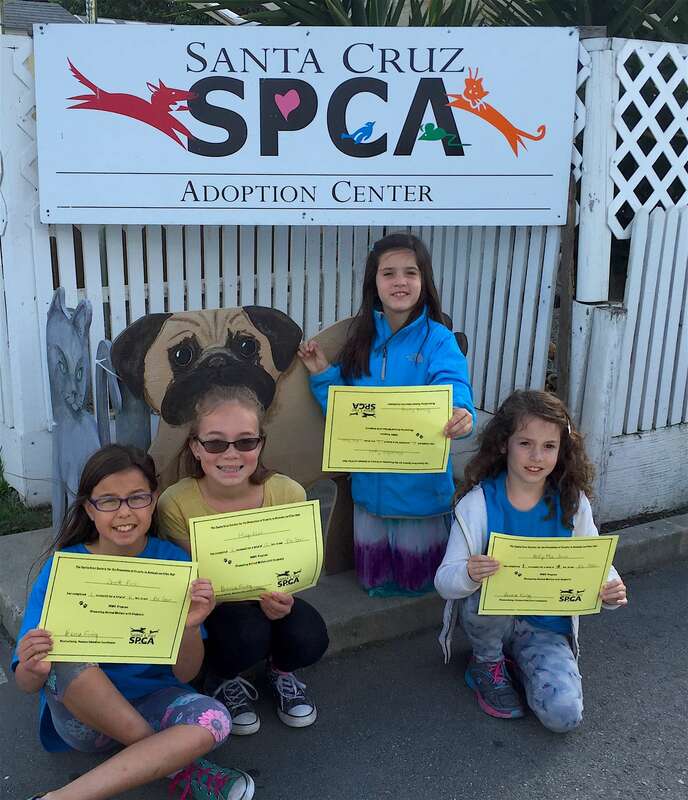 Campers are even given the opportunity to advocate for SCSPCA animals and help them find homes! What should I send with them? Please send a lunch and something to drink every day. We suggest bringing a canteen that can be refilled. During the summer, it will be quite warm, so we also suggest hats, sunglasses, and sunblock, as we will be both indoors and outdoors. We may take one or more walking field trips close by. If your child needs medications during camp, please let us know. Make sure your child wears comfortable clothes that they don’t mind getting dirty. You never know when a dog will drool or a cat will shed some fur. Please also make sure campers wear close-toed shoes. 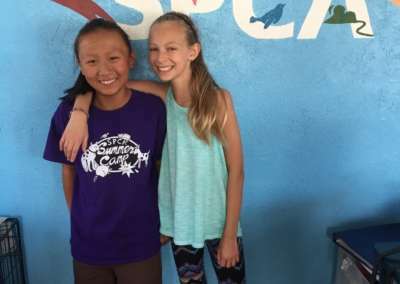 Will they be caring for any animals during camp? 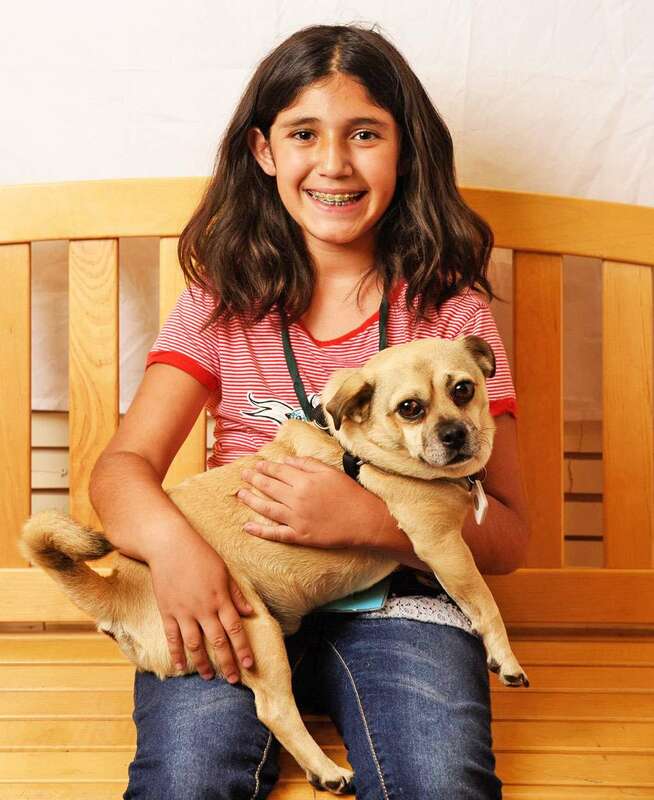 We will be caring for animals that stay with us during the week of camp. “Caring” can include socializing, training, feeding, cleaning up poop/pee etc. How often does P.A.W.S meet? 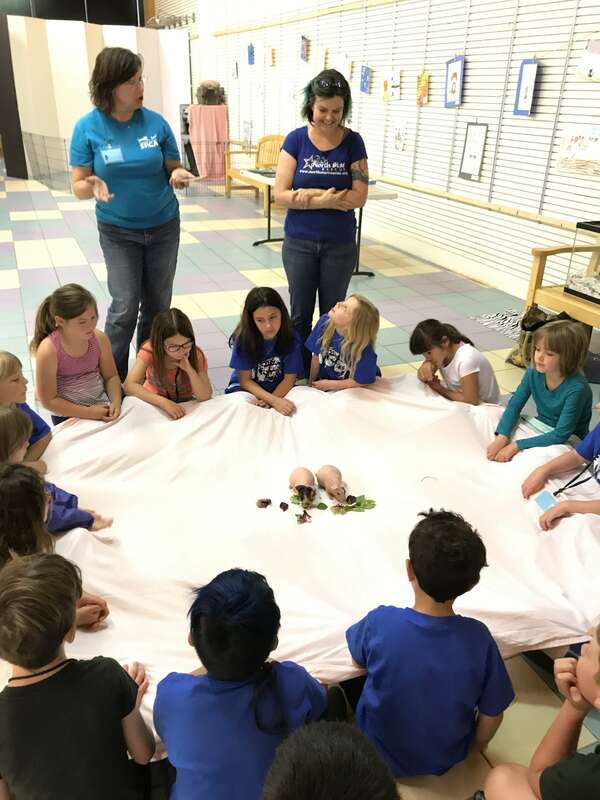 There is a new session of P.A.W.S each month. We meet for three after school sessions a month. Can my child come any day of the week? What if we can’t make it to the shelter by 3:30pm? It's ok for students to be a bit late based on school times and traffic. However, we encourage folks to try to arrive in a timely manner as well as pick up in a timely manner to get the most out of the program. No, it is a drop-off program where students work alongside our education staff. 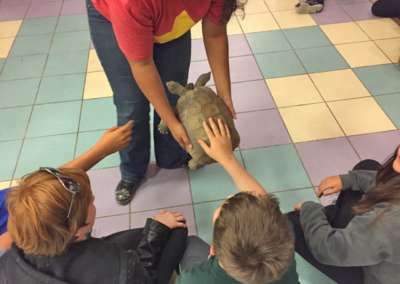 Is it hands on with the animals? 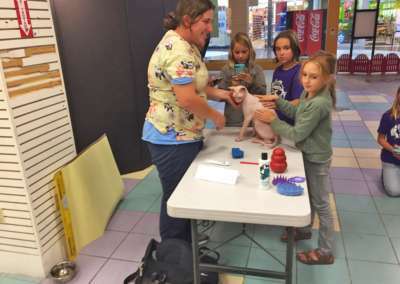 Yes, students will be working hands on with both cats and dogs. 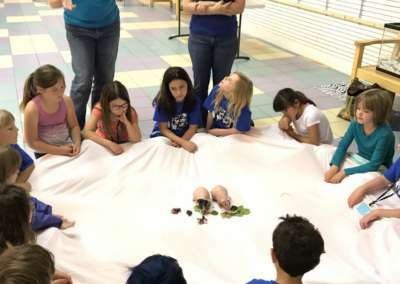 What should my child wear to the session? 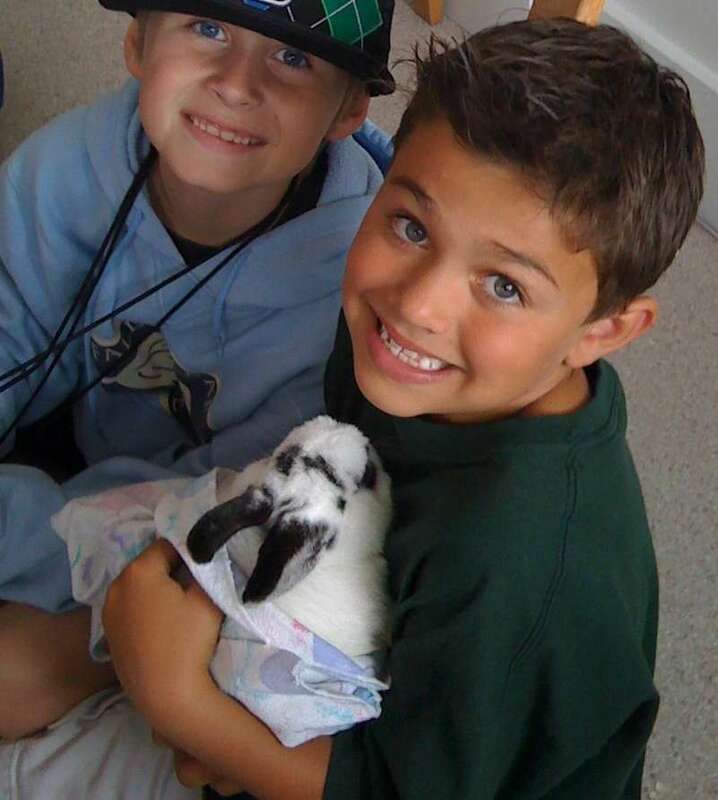 For safety reasons, we ask that all students wear long pants and closed toed shoes while here working with the animals. 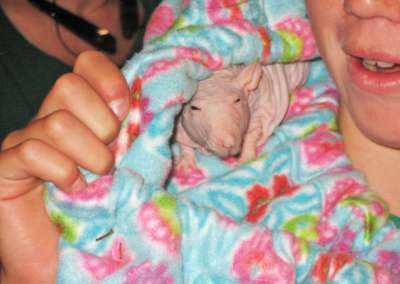 What if my child has no prior animal experience? That's ok! Each new session has an orientation on the first day where we go over safety and handling. 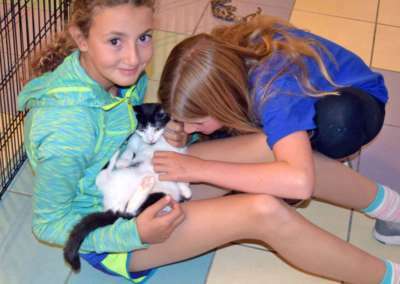 Students work with kid-safe animals and are always being supervised by an adult. 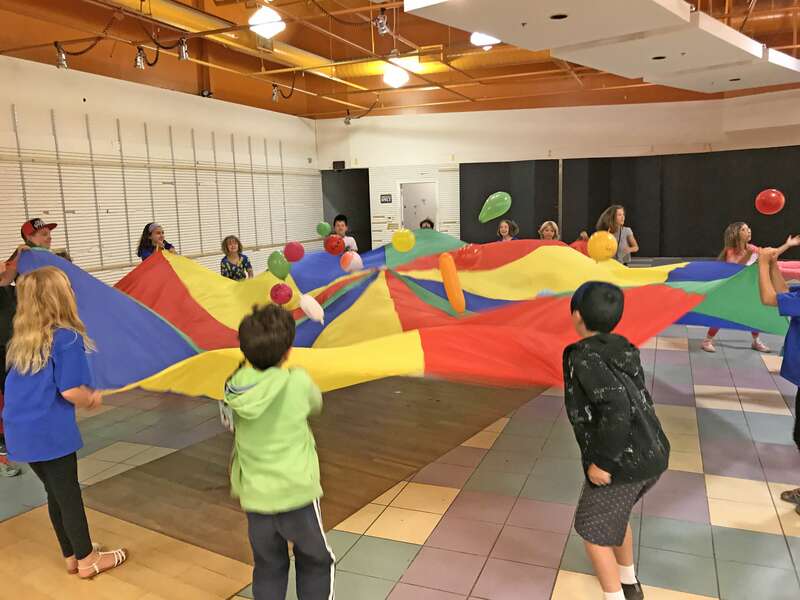 Can my child sign up for more than one session? Yes. 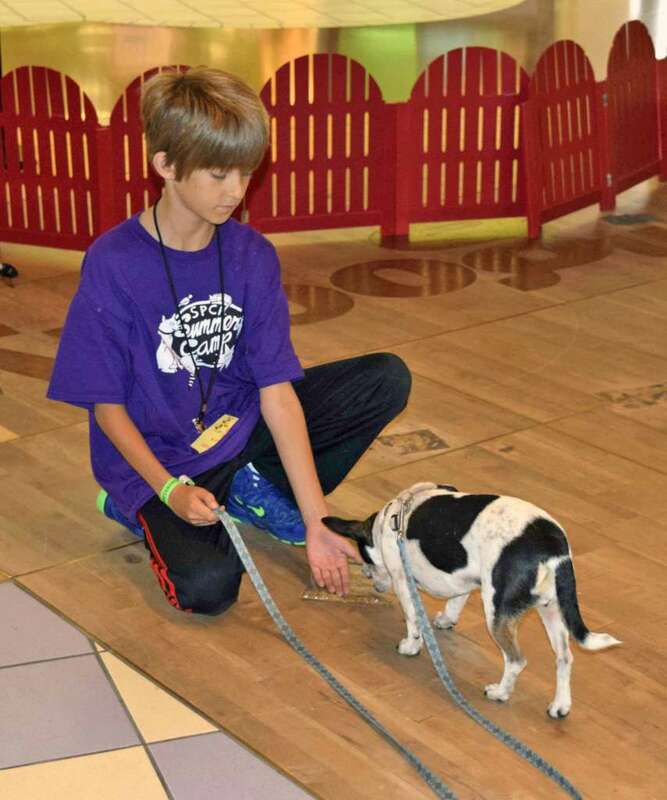 We have quite a few repeat P.A.W.S students who get to work on their animal handling skills each time they come. Will this count toward Community Service Hours? We would be happy to sign off on community service hours per session as long as the student brings along the appropriate paperwork from the school. 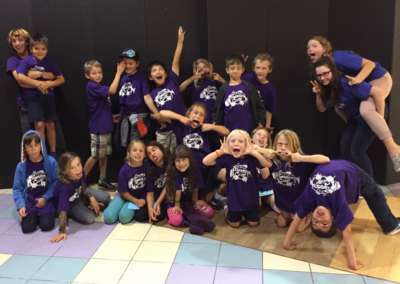 We also have another youth volunteer program (Community Service Saturdays - see Youth Volunteers tab) that occur on the last Saturday of every month from 11am to 3pm. 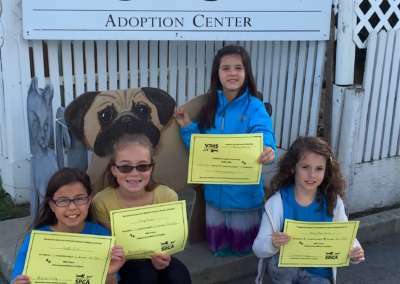 How do I sign up for P.A.W.S? 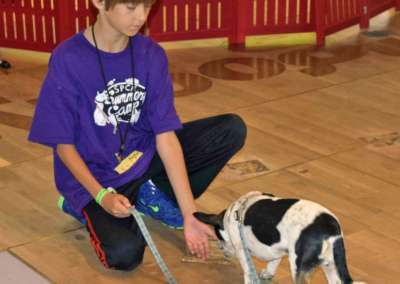 To sign up for P.A.W.S, visit the Youth Volunteer tab of this page. 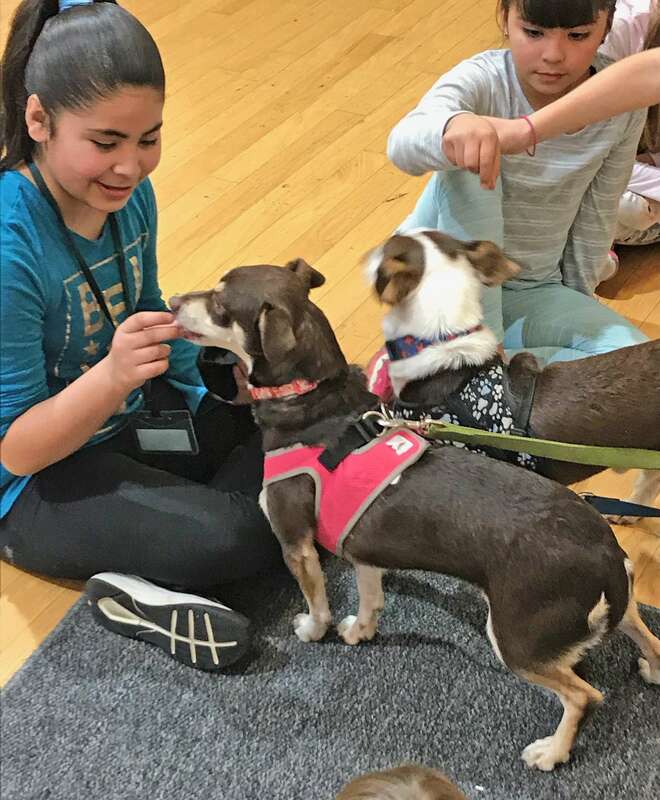 Once you are registered, we ask that students, along with a parent or guardian, attend one of our twice monthly general volunteer orientations. Sign up for an orientation on the Orientation Signup tab of our Volunteer page. These sessions are geared toward middle and high school students in need of community service hours. 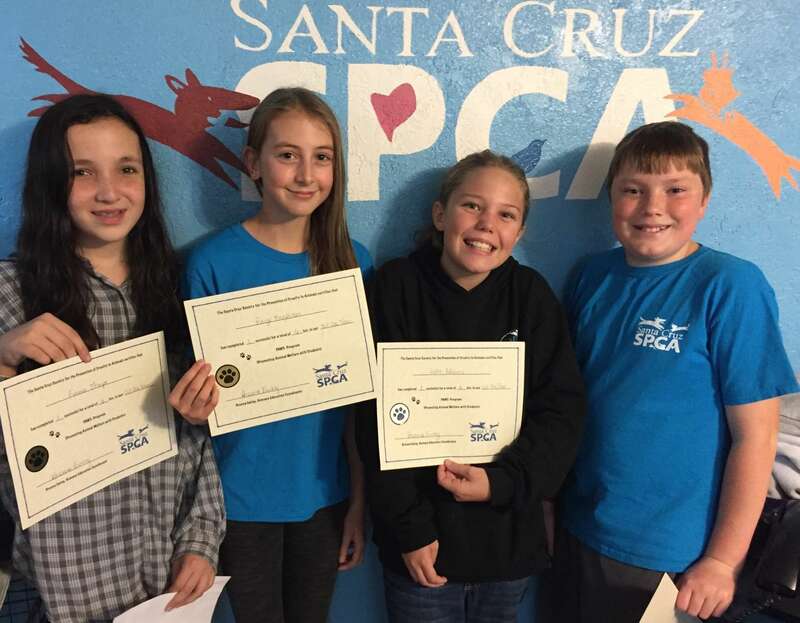 However, if you have a younger student who is interested, you can contact our education department or call 831-566-3753. 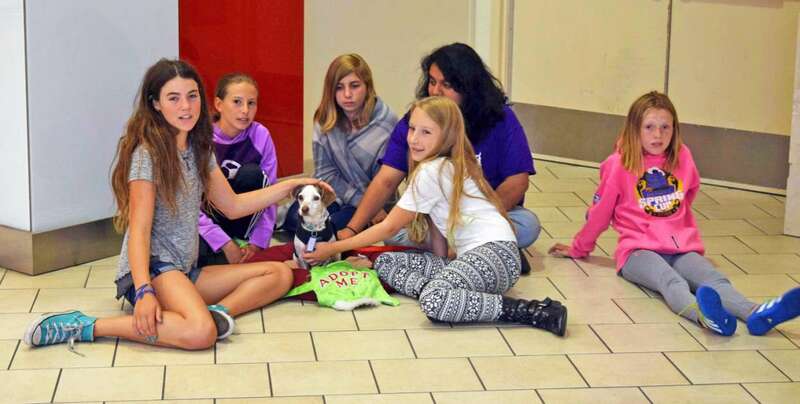 Community Service Saturdays happen one Saturday a month, usually the last Saturday, from 11am to 3pm. No, it is a drop off program where students work alongside our education staff. 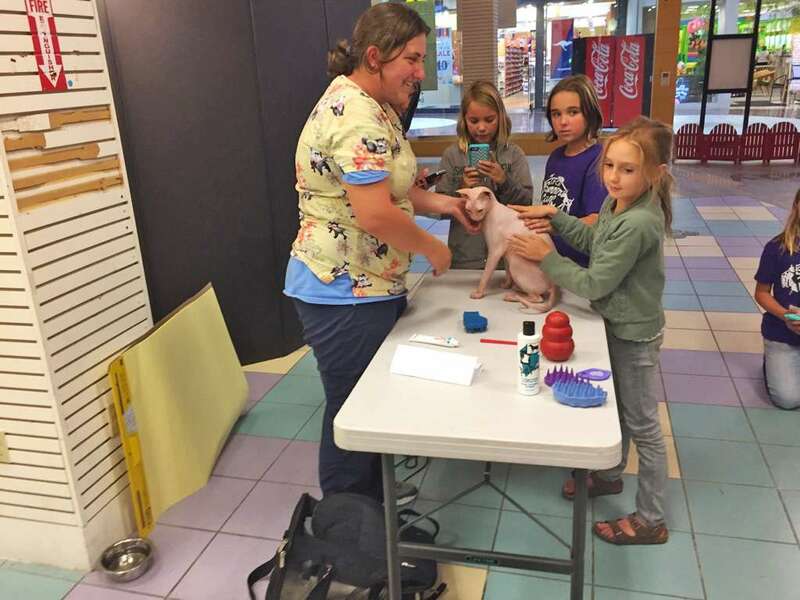 Is the program hands on with the animals? The first half of the day is devoted to project-based work around the shelter, such as: organizing, cleaning, weeding, etc. 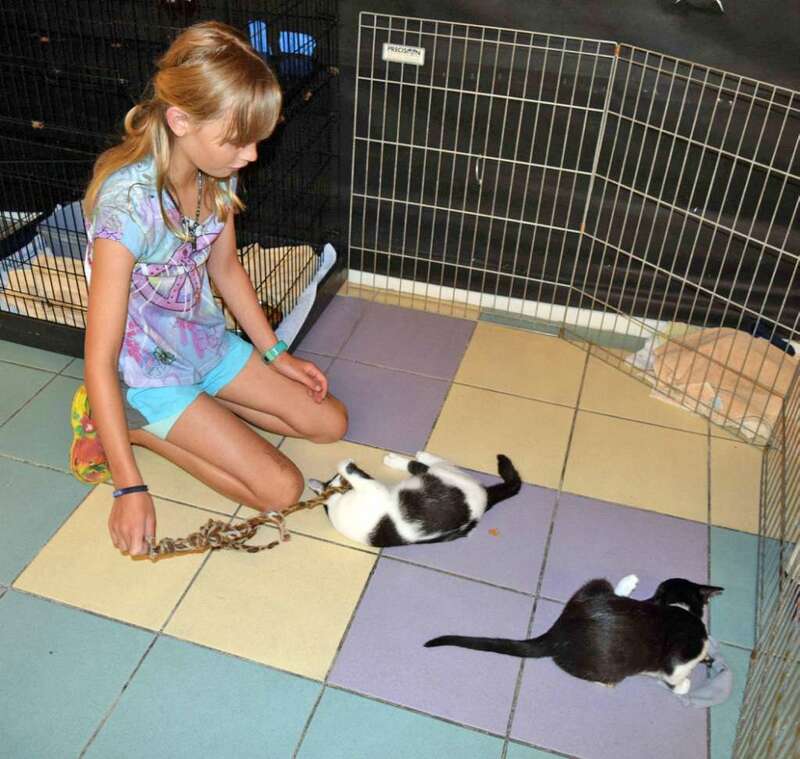 The latter half is devoted to hands-on time with both cats and dogs at our shelter. We recommend that students bring a jacket, a water bottle, and a lunch or snack. We also ask that they bring along any paperwork that they need signed for their community service hours. Yes. 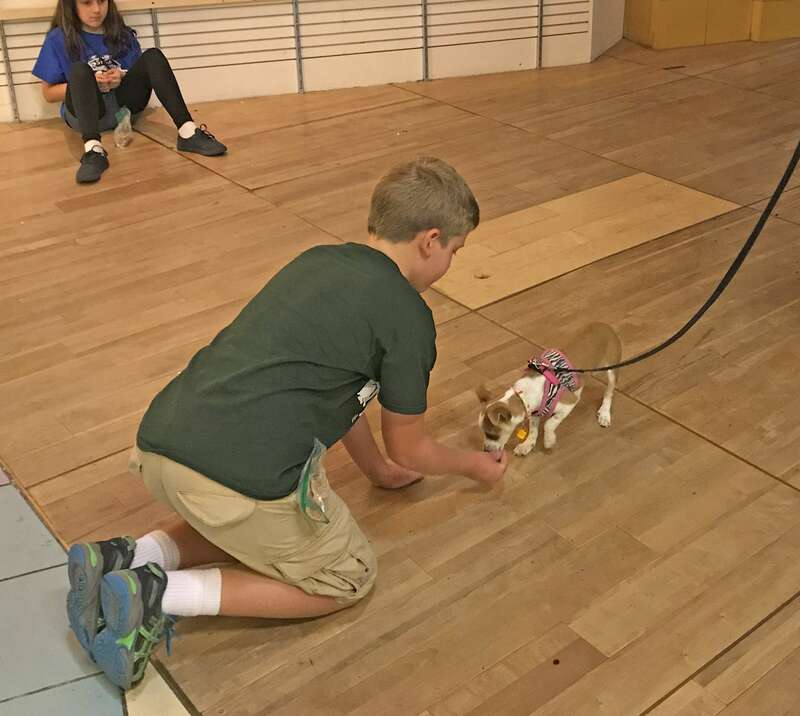 We have quite a few repeat Community Service Saturday students who get to work on their animal handling skills each time they come. How do I sign up for Community Service Saturday? 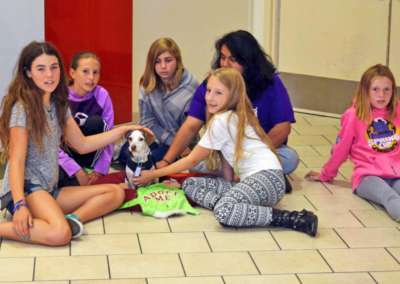 To register for Community Service Saturdays, visit the Youth Volunteer tab of our Humane Education page. 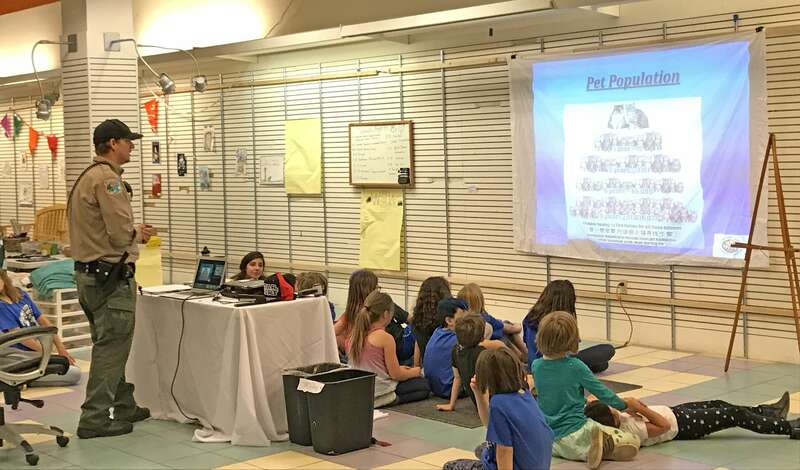 Once you are registered, we ask that students, along with a parent or guardian, attend one of our twice monthly general volunteer orientations. Sign up for an orientation on the Orientation Signup tab of our Volunteer page. How old do you need to be to read to the animals? 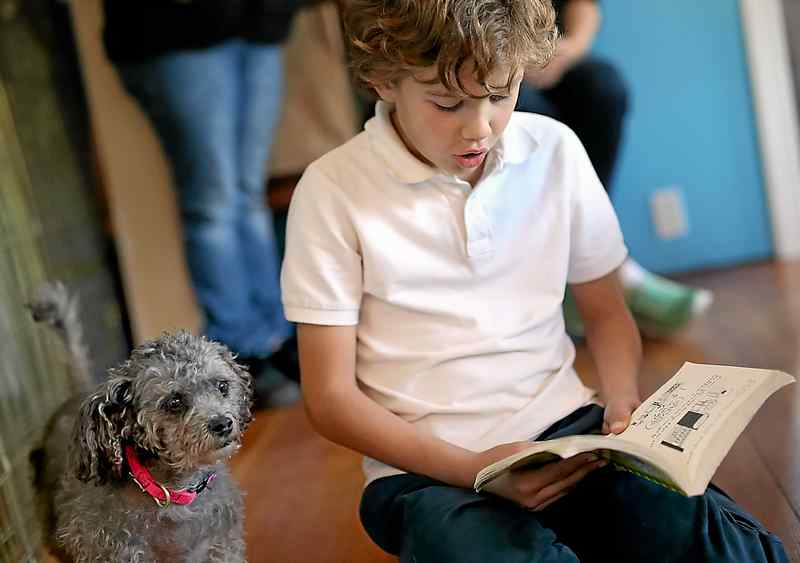 The Rescue Readers program is geared toward primary and secondary students in Pre-K through 8th grade. Do students need to come with a school group? No, we also take individuals as long as they are accompanied by a parent or guardian. What is the largest school group you can take? In our current facilities, we can take up to 20 students. 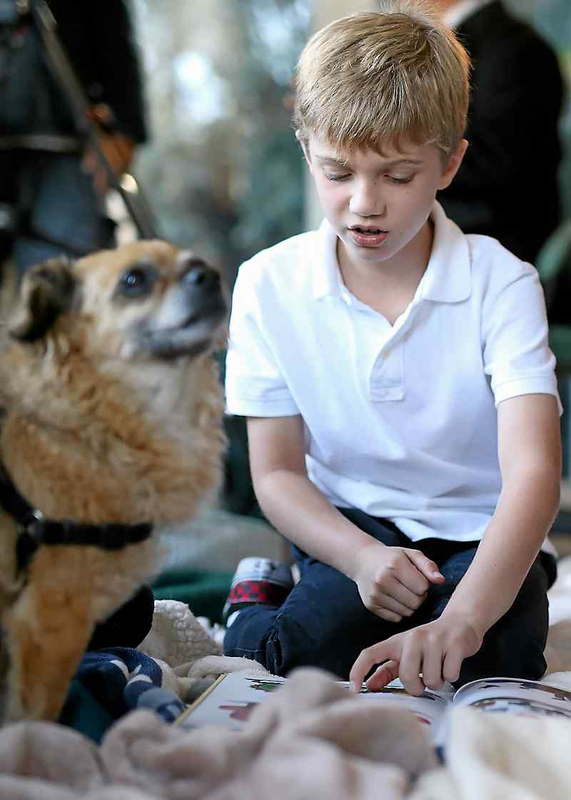 However, we can also come out to your school with our education dogs to accommodate a larger group. 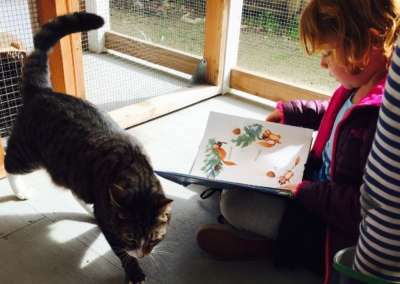 Will they be reading to animals in cages? We try to have children reading in a separate open space where the dogs and cats can get comfortable and ready to listen. 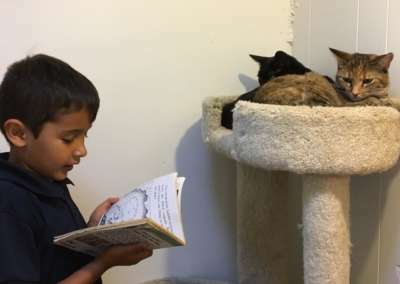 Can they read to both cats and dogs? 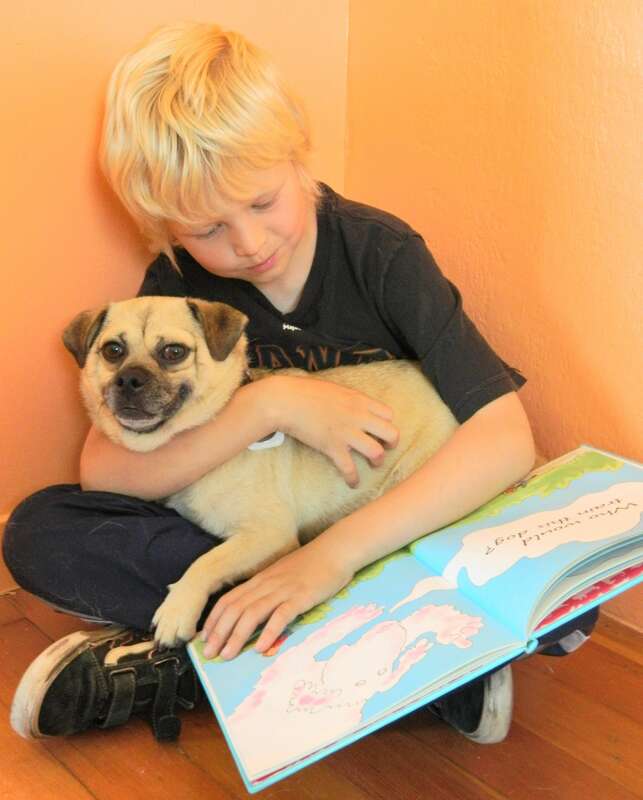 When children visit our shelter to read, they can read to both cats and dogs in our care. 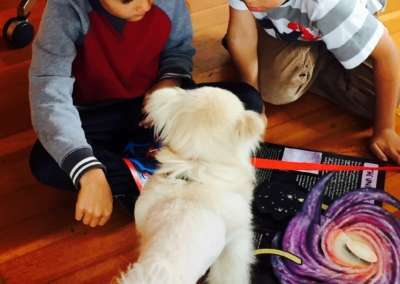 When we come out to classrooms, we can only bring education dogs with us. As you can probably imagine, the transportation of cats to a new environment is rather scary, so they stay at the shelter. Can they read to any animal they want? 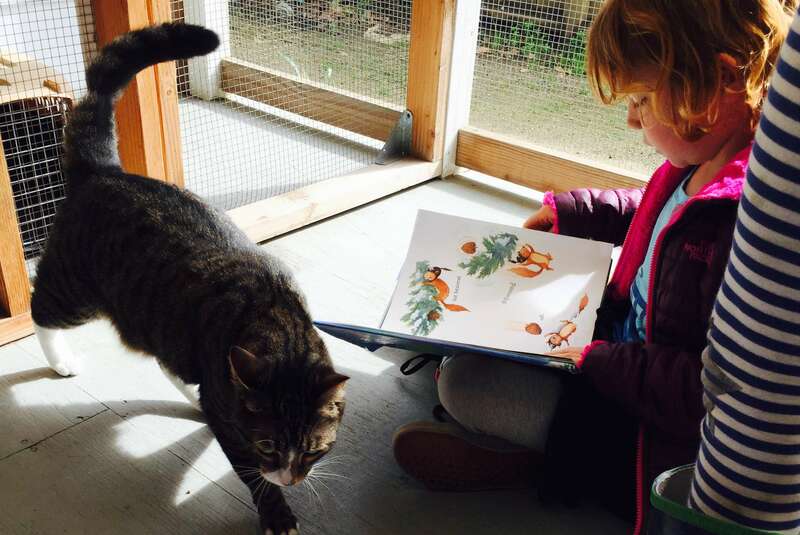 So that both the children and the animal(s) can get the most out of the interaction, we typically choose who they will be reading to. Why do you offer this reading program? 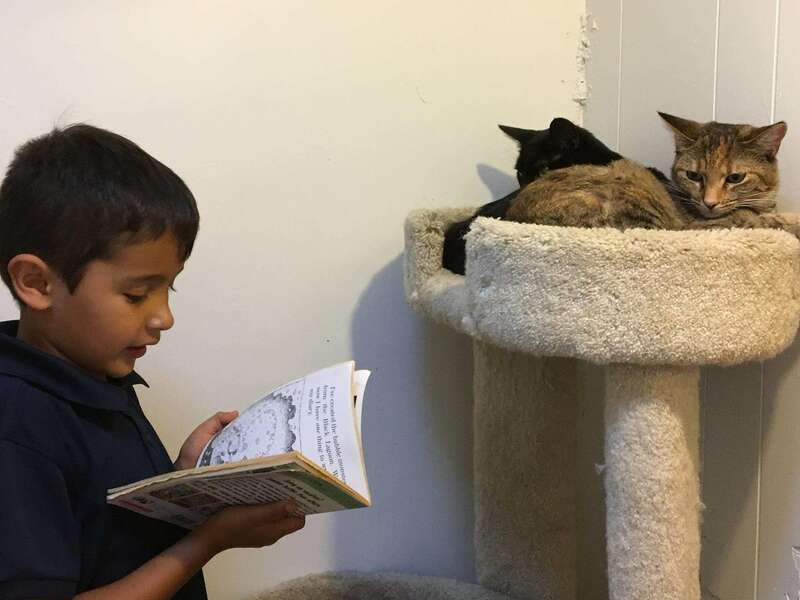 We hope to provide our animals with some comforting companionship while at the same time help students in our community to become better readers. 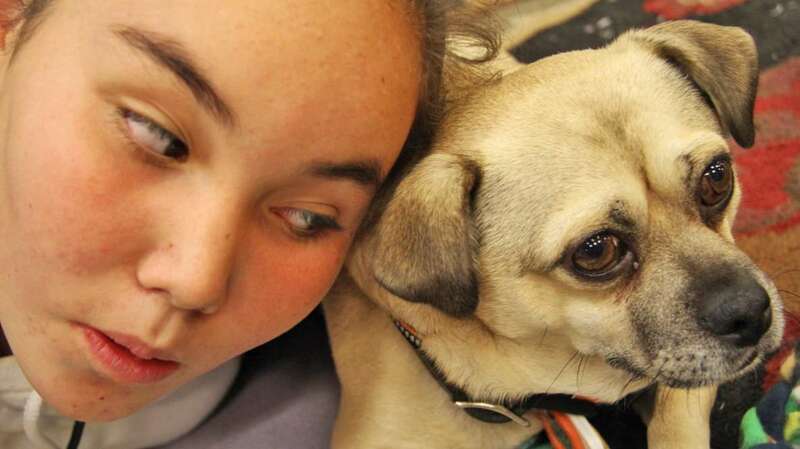 The animals are non-judgmental listeners who allow students to practice as much as needed. 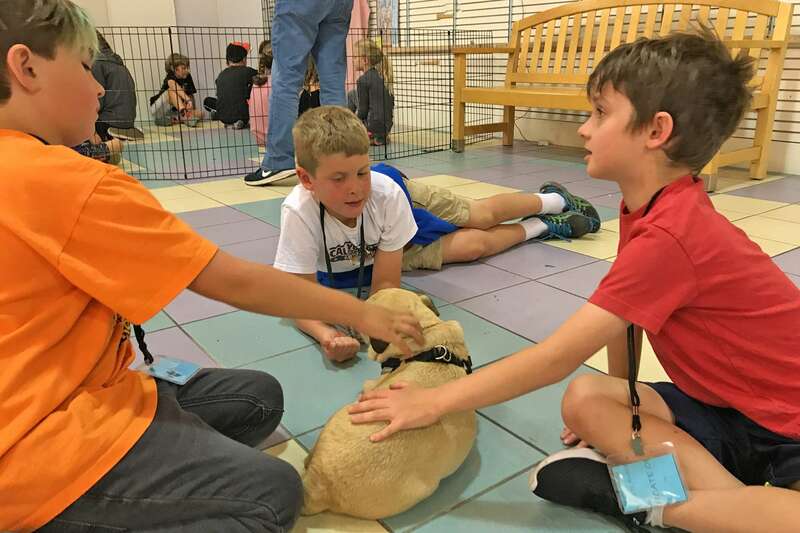 The cuddle time with our shelter animals or education dogs is just an added bonus that also teaches students about the wonderful animals waiting in our shelter for homes! How long are the reading sessions? 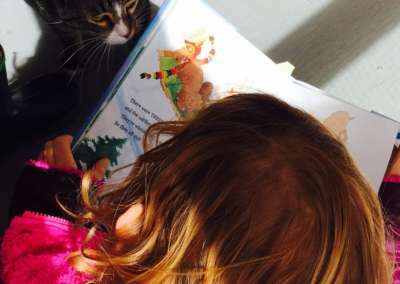 The average reading sessions last 30 minutes to an hour, but there is no strict time limit for sessions. Sometimes our readers will bring one book and sometimes they will bring many! Do they need to bring their own books? 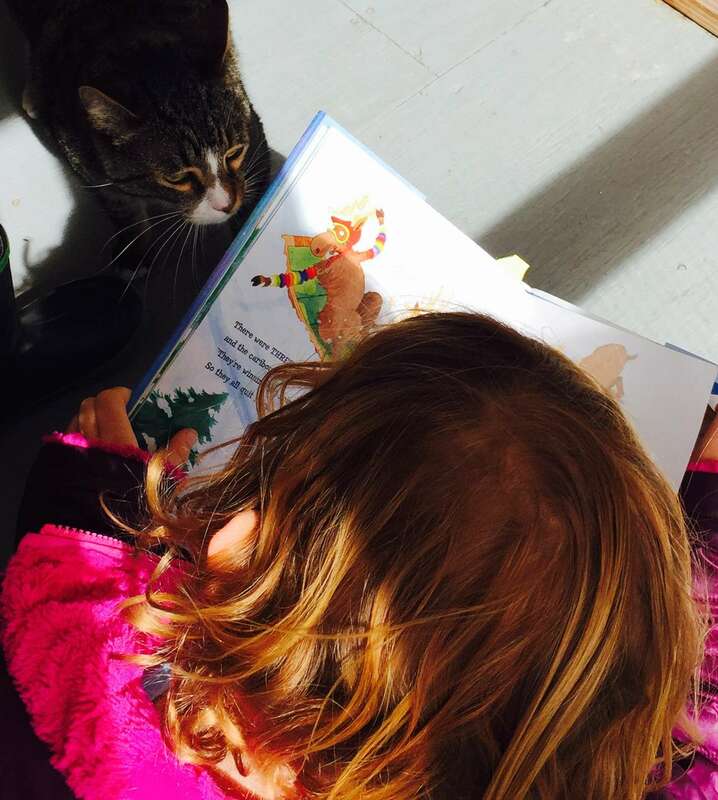 We encourage you to bring your own reading material that is at the appropriate reading level. However, if you need books for reading, let us know and we can provide them. 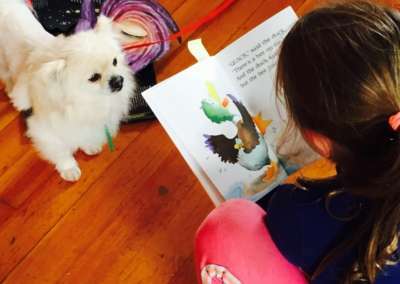 How do I sign up for Rescue Readers? 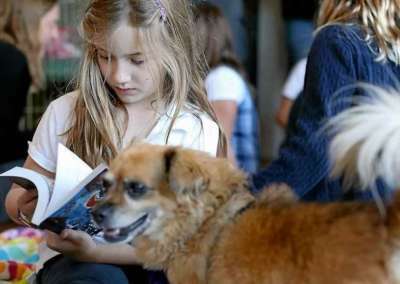 To register for Rescue Readers, please contact our education department at or call 831-566-3753.